The Samsung Series 9 27” Monitor (S27B970D) Manual or user guide now available for download directly at samsung offical website. The Samsung Series 9 27” Monitor (S27B970D) Manual comes in PDF format with file size is 7.46 MB and has 67 pages also support in english, spanish and korean language. In the Samsung S27B970D user guide provides many reference information and instruction especially about how to using this monitor correctly and troubleshooting guide. For example you can find information about Securing the Installation Space, Electricity, installation, operation and Safety, learn monitors part overview, NCE Program Installation / Uninstallation, Starting NCE (Natural Color Expert), Connecting the Calibrator, MHL (Mobile High-Definition Link). Then in the owner manual also provides detail information such as Checklist before Connecting to Source Devices, Connecting the Power, Connecting and Using a PC, Driver Installation, Setting Optimum Resolution, Changing the Resolution Using a PC, Changing the Dynamic Contrast Setting, Sharpness, HDMI Black Level, Configuring Color Mode like red, green, blue, gamma, Configuring Image Size, Configuring Menu Transparency, Configuring PC/AV Mode, Configuring Display Time, Configuring Brightness and Contrast in the Initial Screen, Samsung Customer Service Center, Q & A. For troubleshooting including issue like Installation issue (PC mode), Screen issue, Audio, Source device, and other issues. 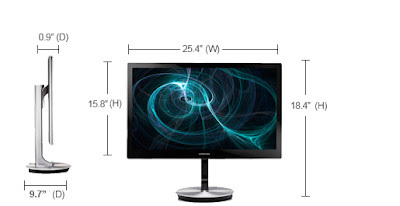 The Samsung Series 9 27” Monitor (S27B970D) measuring 25.4" (W) x 18.4" (H) x 9.7" (D) (With Stand). 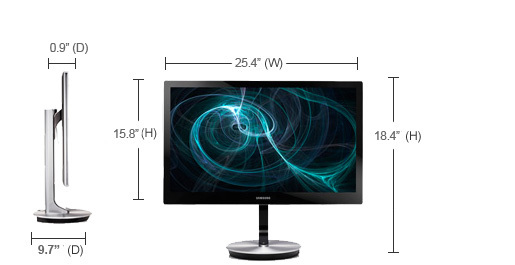 The weight of this monitor is 18.04 lb.It has 27" Wide, 16:9 Aspect Ratio with 2560 x 1440 resolution. Support inputs like Dual Link and HDMI. More detail about the table of content for the Samsung Series 9 27” Monitor (S27B970D) user Manual also download link information read below. The power LED is off. The screen will not switch on. There is no image on the screen and the power LED blinks every 0.5 to 1 second. A beeping sound is heard continuously when my PC is booting. The stand generates heat. Why is that? Does this mean that the product is defective?